“Quality is assimilated quantity”: words of the French poet and essayist Léon-Paul Fargue (1876–1947), quoted in the notes to this release, and words that seem so appropriate to read before undertaking a new journey to the treasure house of Scarlatti’s 555 keyboard sonatas. 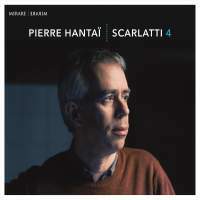 The harpsichordist is Pierre Hantaï, in his fourth volume of Scarlatti for the French label Mirare—an evolving series of the composer’s unique masterworks. Hantaï’s instrument is a modern reproduction, modeled after unspecified German harpsichords of the 18th century and built in 2004 by Jonte Knif. Fanfare critic Laura Rónai gave rave reviews to Hantaï’s first and third volumes in this series. She wrote that the “resulting performance [was] not just impressive [but] actually awesome and unique.” She noted how close to chaos Hantaï descended before using his “impeccable technique” to pull himself back from the brink of musical misfortune into playing of “perfection devoid of mechanics.” Wow. As a lifelong, card-carrying contrarian, I read these reviews and sensed the hyperbole that occasionally grabs hold of many a well-meaning critic. I had not heard Hantaï in Scarlatti before, which instinctively led me to have a critical counterpunch at the ready. Then I listened. Rónai was not wrong. Hantaï is made for Scarlatti, playing his sonatas as if possessed. There is no middle ground on which this artist seems willing to compromise his vision of the composer. There is no denying that pianists have a claim to this repertoire too. But the doyen of Scarlatti scholars, the harpsichord virtuoso Ralph Kirkpatrick, made an important point in his instrument’s favor and it is worth citing in part here, “[The piano] tends to diminish into a general uniformity of color many of Scarlatti’s most striking effects of orchestral tutti, of alterations of high and low register, and contrast of chords and acciaccaturas with his prevailing two-voice writing.” In Hantaï’s hands Scarlatti’s orchestral colors come alive, and Kirkpatrick’s advocacy for the instrument becomes a just cause. Listen in particular to Hantaï’s performance of the Sonata in A Major, Kk 456, and the explosive launch he gives to the Sonata in E Major, Kk 381. It’s all there, along with the harpsichordist’s keen perception of Scarlatti’s rhythmic universe, the importance of which Kirkpatrick went to great lengths to help both players and listeners understand. One of the most inspired works on this release, the Sonata in E Minor, Kk 402, is also the longest—a pensive and masterful Andante of nearly 11 minutes—featuring a framing device of rests and pauses within the piece that serve to highlight its rich harmonics. It also allows Hantaï to demonstrate his considerable musical gifts from a different angle. The work is followed with its pairing, the Sonata in E Major, Kk 403, a piece of two minds—festive but with just a touch of irony. Here, and in several other works on this release, the influence of Spanish folk music and dance can be heard, a stylistic signature that enlivens so many of Scarlatti’s sonatas. Playing Scarlatti, like playing Mozart, is to find oneself in a goldfish bowl. Everything is transparent with nothing to conceal your mistakes or misjudgments. Hantaï swims like a fish in these musical waters. Warmly recommended.